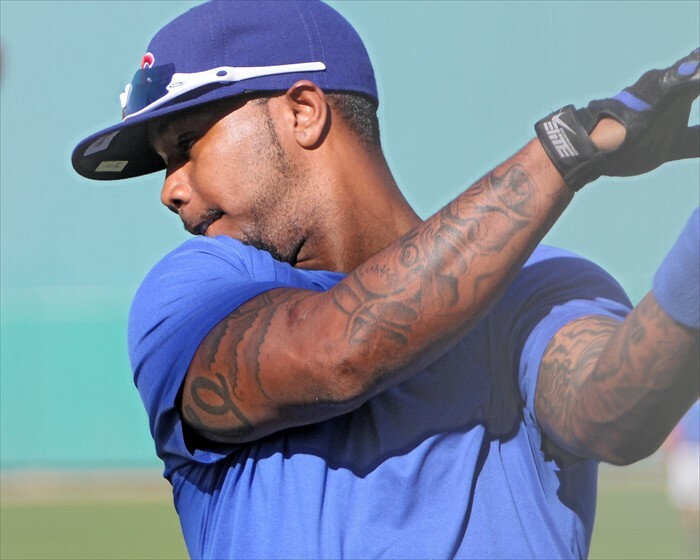 The final football game of the season is tomorrow, when that is finished we will be less than two weeks from Cubs pitchers and catchers reporting to Mesa for spring training. So before I get completely immersed in the Cubs and that spring thing, let’s talk football. While watching batting practice at Camp Bussie yesterday I realized we have the makings of a pretty good pick-up football team here. 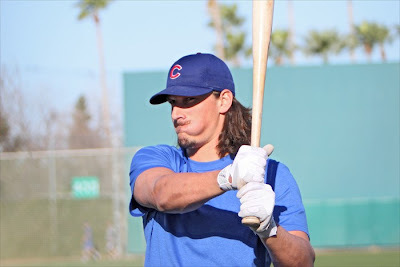 As I’ve mentioned in this blog recently, most of the guys currently working out here have not played in the majors yet, Jeff Samardzija, Darwin Barney, and Tony Campana being some of the exceptions. Of these 15-20 baseball players at Fitch, there is some serious football talent – Jeff Samardzija Wide Receiver with his nearly 200 receptions and 28 TD catches over his last two years at Notre Dame. 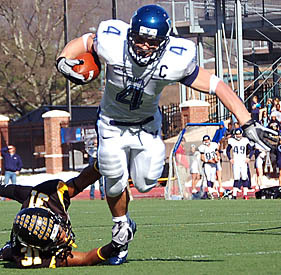 Cubs 2010 5th round draft pick Matt Szczur (pronounced Caesar) helped Villanova win the 2009 FCS National Championship game with 270 all-purpose yards and 2 TD’s, while accounting for 35 touchdowns in his Wildcat football career. 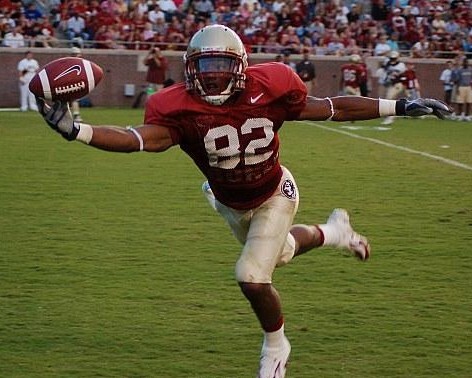 Then there is Taiwan Easterling who in 2010 was busy catching passes from Christian Ponder at Florida State. After three seasons Easterling ranked 18th on the FSU all-time career receptions list before opting to sign with the Cubs. The idea that it takes some thought to decide who has the better receiving core the Bears or the Cubs, is frightening if you’re the football team in this comparison. Tomorrow’s Super Bowl between the Patriots and Giants is a rematch from four years ago and was one of the more exciting Super Bowls on record. When the Giants ended the Patriots perfect season on Feb. 3, 2008 with a last minute touchdown it also snatched of 5 large, (that’s 5K, 5 big ones, 5 grand) out of my hands. I am not endorsing gambling in any way, but for that game my brother and I went together playing a big numbers board, getting one square for $200 bucks. Since I really didn’t care who won or lost the game I was willing to essentially throw away a hundred dollars for a chance to make the game a little more interesting. The game was tight but our number was never close on any quarter, until late in the fourth when the Patriots scored a TD with 2:42 left in the game to go ahead 14-10. BINGO! That was our number and we had just over two minutes left and the big game ending winnings of five thousand dollars would be ours. We were helped by the fact that it was a 4 point lead so unless the Giants got down field fast, there was no need for a field goal. It was a touchdown or nothing. And so began the longest 2 minutes of a football game in my life. You may not remember the whole final drive with great clarity unless you are a Giants or Patriots fan but let me tell you – it took forever. Just over two and a half minutes on the clock but in real time those final minutes must have taken nearly a half hour, or so it seemed. The Giants used all three of their timeouts during the drive, the two minute warning happened as well. The Giants converting a fourth down conversion with 1:32 left to keep the drive alive, then Pats CB Asante Samuel has a potential game winning interception go through his hands. During all this time all I could do was pace back and fourth. And then it happened, that moment in a game when a certain play or action takes place when you know it’s not going to go your way. 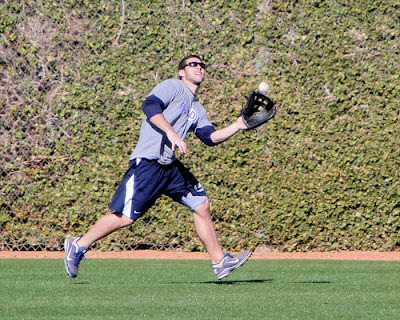 As Cub fans it seems we have an innate sense of when that moment hits. Eli Manning somehow escapes a sack while guys have hold of his jersey, he breaks loose and heaves the ball downfield where somehow David Tyree catches it against his helmet with a defender draped all over him. I knew then that the 5K was never going to be mine, it was inevitable. You know the rest, Manning to Burress with :35 seconds left, bye bye $$$. In the beginning of the game I said “I don’t care who wins I just want an exciting game,” that however was way too much excitement. I also know it was a heart breaker for the Patriots fans, losing an undefeated season that way, but they have won plenty so no tears for them. Afterwards I told myself and my brother, “no big deal it wasn’t meant to be.” That’s easy to say but when a chunk of money is dangling right in front of your face like the proverbial carrot, it still stings a bit. I hope tomorrow’s game is exciting, just not quite that exciting. Here are pics I took yesterday of the Cubs gridiron guys working at their chosen profession.